January is traditionally a time when people like to offer us lifestyle advice; as if wise to the fact that we have been eating and drinking too much over the preceding two weeks or so, which is probably true, but also on the assumption that we actually feel guilty about it. Some of us are stronger than others in this respect, or at least wiser to the hard sell of those preying on our remorse over those six extra slices of pork pie. Few things are more doomed to failure than the ‘new year, new me’ short term-ism of reluctant cash injections on diet magazine subscriptions, gym memberships and dry weekends watching ‘Take Me Out’ with a glass of Cranberry Schloer. You can imagine the scene as willpower is pushed to the limit throughout the country; invites to the pub are turned down in exchange for a case of mineral water and a DVD, and the Steak and Chips treat on a Thursday is blown out for a joyless homemade Cous-Cous Salad. It gets to the stage where a Ryvita with low-fat spread at midnight is the only carefree vice you will allow yourself, and while you hear tales of your mates out enjoying life, your cheerless existence will continue until you hit a pre-determined and frankly unrealistic weight target. Or you give in and join the rest of us back in the real world. In short, if we truly wanted to adopt such a lifestyle, we wouldn’t wait until January every year to half-heartedly attempt it, and we wouldn’t approach it with disdain, rather like a residential health and safety training course in Luton. The calendar change from December to January, in truth, is no more significant than May 21st turning into May 22nd. Night turns into day, like any of the other 365 days, yet many people are lured into new and uncomfortable behavioural patterns which any other time of year wouldn’t be on their radar. That is not to say that we at the Old Peacock frown upon a healthy lifestyle of course. Everything in moderation is the way; “a little bit of what you fancy” as the saying goes, and the pathway to wellbeing is being able to balance exercise and nutrition with good food and good beer all year round, rather than a lacklustre and ill-fated attempt at shock therapy once we’re knee deep in regret and the clock ticks over into a new year. Which is why we are sticking to a winning formula at the Old Peacock in 2016. We know what you want and we know how to get it to you. 2015 proved to be a hugely successful year for the pub. Our food menus were more popular than ever, we hosted three great nights with ex-Leeds United stars Norman Hunter, Duncan McKenzie and John Lukic, we installed our new match day marquee in the beer garden and we took our place on a global stage when we welcomed the Rugby World Cup to Elland Road. Perhaps most importantly, we continued to welcome thousands of regular customers through our doors. Being where we are, it would be foolish to ignore the fact that Leeds United match days are a big deal, and so much work goes into ensuring they run smoothly and everyone has a great time. This is why we invested in the match day marquee and I think everyone agrees it has been a huge success and has contributed to smaller beer queues and happier faces all round. I have spoken before about how the pub is part of Leeds United’s tapestry – having existed long before the football club was even formed - and it is hugely important that we recognise that and be faithful to our heritage as a vital cog in the match day experience for Leeds United fans. At the same time, the Old Peacock has been an essential part of everyday life in the local community since 1826, even more so today as other hostelries in the area like the New Peacock and the Wheatsheaf have long since bitten the dust. For that reason, we also work very hard to ensure that on the 340 days-or-so that Leeds United aren’t playing over the road, we are serving our regulars with a good range of local ales and providing hearty, well-cooked food on our menus. The success of our kitchen and how busy it is during the week and on non-match weekends, and also over the recent Christmas period, suggests we have got the formula right, but we won’t be resting on our laurels this year. In our bid to offer something for everyone, we will be launching our new Curry Night in the next few weeks. 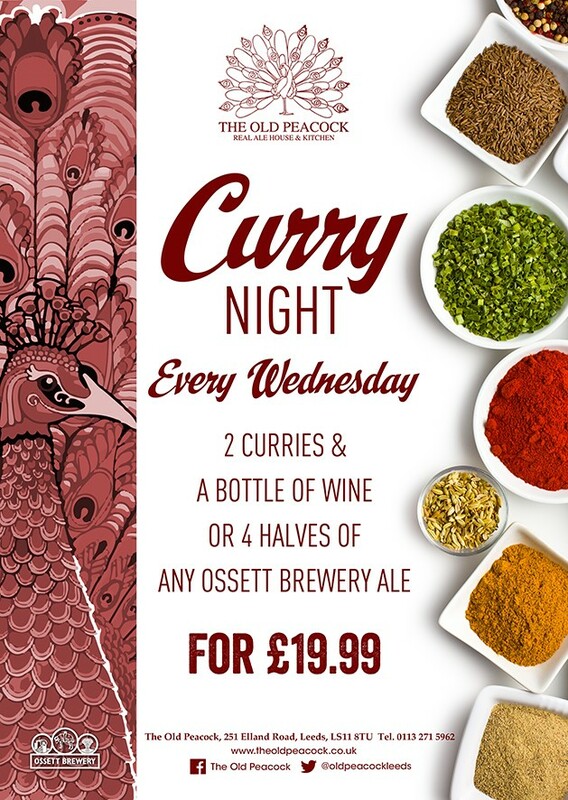 To accompany our Burger, Steak and Sunday Lunch menus, our Curry offerings will be a feast of the best eastern cuisine, a value-for-money midweek treat to get the taste buds tingling and a nod to the nation’s favourite dish. The wafting aroma of the finest Indian spices might even tempt some of our regulars who have a more traditional palate. More details on that soon, but in the meantime we are pressing ahead with more of our successful Leeds United ex-player nights for 2016 and are always working on sourcing new beers, wines and spirits, and introducing new dishes to our ever-expanding all-day menu. So while fad diets, intense detox and a pretty dismal sin-free January is on the agenda for much of the country, or at least for a fortnight or so, we will continue offering a little bit of what you fancy at the Old Peacock. It can’t do any harm. On a more serious note, regulars in the pub will notice the absence of Dawn behind the bar over the next few weeks. Dawn was featured in our last blog post, being a veteran of nearly thirty years’ service at the Old Peacock, and offered us some priceless insight into a time when all the Leeds United first team players used to frequent the pub. Unfortunately Dawn had an accident last week, has fractured her fibula in her right leg, and will be on crutches and off work for several weeks. Staff and management have often joked that, like the ravens fleeing the Tower of London, the pub might collapse and fall down if Dawn ever left, and I guess we are about to find out. Dawn’s absence will only be temporary of course and she is already complaining of boredom, so hopefully she will make a speedy recovery and be back pulling pints and changing barrels before too long. Leeds United’s results have picked up in recent weeks and thankfully there is an air of calm around the place for once, although with the January transfer window opening this week we don’t expect that to last for long. January is a fairly quiet time for home games though, with only Rotherham in the FA Cup and a date with Bristol City on the 23rd on the agenda. Just the job to ease us into the New Year. In the meantime, check out our Facebook and Twitter pages for all the latest updates on events, menus and match days and we look forward to seeing you all again during the course of 2016. Happy New Year!